I am a loyalist…in friendships, relationships and, apparently, music. If anyone hears that Mary J. Blige will be on tour, 8th grade Joy will be there. My love for 90’s R&B aside, I have a band that I have listened to every album incessantly. I have attended five shows, and their band name, “Needtobreathe” comes up in my phone’s predictive text. 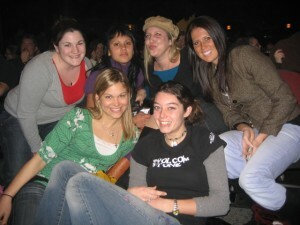 It all started one winter’s eve when some friends and I got free tickets to a show. One friend had heard of the opening band and said they were good, but I figured any band that smooshed three words into one couldn’t be that swell. The lead singer’s cool points went up when he announced that his name was “Bear.” Then, he sat down at a little piano and I heard “Don’t Wait for Daylight” for the first time. I have since listened to that song 4,534,309,672 times. I leaned over to my friend, Dane and said something about this guy’s voice being insane and the music making me want to jump up and run around. Yeah, it was a “sit down” concert. You know how most musicians sound way better on an album? Not Bear. Since Bear’s voice was so powerful live and I immediately fell in love with the songs, I purchased their first album. That’s when the loyalty kicked in. Have you ever wondered what a “soundtrack to your life” would sound like? 70% of Needtobreathe’s songs hold some meaning or memory for me. Many of their lyrics resonate with me, and the variant of slow to up-beat to fist-pumping-rock gives my A.D.D. some selection. The second album was all about break ups and love. Nothing new to the world of music, but I loved it and listened to it…over…and over. Especially during my own break up. Ugh. The most dramatic “soundtrack” moment happened one morning at 7 am. I had to make the hardest decision I’d ever made. I knew what I needed to do but felt paralyzed and broken. I was driving to an event where I had to be “on” but the tears were flowing so hard that I had no clue what I would do upon arrival. Just then a song from Needtobreathe’s first album (at that time their second album was being aired) came on the radio. It was never a single. I’ve never heard them perform it at a concert. It was never a popular song. Call me dramatic but the lyrics to that song were hauntingly what I needed to hear and the motivation to pull the trigger on what I needed to do. Never before or after have I heard that song played on the radio. I’m going to keep the song title to myself, but that is a moment that some might dismiss but I embrace as a little gift. The movie continues, but I’ll spare the drama. The third and now fourth albums are also about love and heartache, but what I appreciate (since some music can send me into depression by the very nature of its sound) is that none of their songs take me into an unhealthy sadness. Most of it makes me feel like I’ve taken seven shots of espresso with a Mountain Dew chaser. And that is why their music is not only my life’s soundtrack choice, but also my “get motivated to ride up that hill” choice. It’s known among the people I bike with, that if Joy is getting tired, she just needs to listen to some Needtobreathe. I realize this isn’t totally safe, but if listening to music while road biking with friends is as daring as I get in my life…sue me. The adrenaline kicks in and I have been known to pass a biker or two if the song is just right. 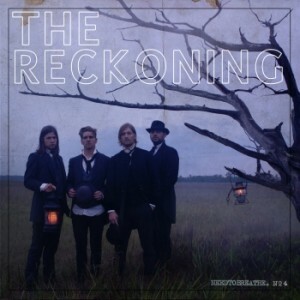 So, if you need a soundtrack for your life or just some motivation to run, bike, or segway up a hill, their new album “The Reckoning” will be the adrenaline kick you need. P.S. Look up a photo of the band. Is it just me, or could the bass player pass for Hilary Swank’s brother? What is a soundtrack to your life? What song can you listen to on repeat over and over and over again? 1. Last year when I was working at Creation West I got to have lunch with them and stand on stage during their set. You would have DIED. 2. Seth, the bass player, is waaaaay more beautiful than Hilary Swank…and his mom set him up on a date with one of the girls that was on the bachelor..I bet there’s a real good story there. 4. People calling each other baby is the WORST. @Chelsea, Love it all. I actually chatted with Seth after a show once and somehow we ended up trying to remember the lyrics to a non-needtobreathe song. Next thing I know, we are singing. So glad you agree with me about “baby”. Makes me have a tiny gag reflex. (-: But, to each it’s own. 1. I love Needtobreathe. Love them. @Elizabeth, you aren’t copying at all!! Do it. People need to know about the sounds they are missing. All the Nickel Creek cd’s. I know them front to back, back to front, sideways and downways. I have all the instrumental mandolin and fiddle parts memorized and could hum them out to you if you asked. Their cd’s are moving, but live, they are epic. I saw Nickle Creek at the Troubador in Hollywood when I was in college. I couldn’t agree more. They are epic live. I LOVE Needtobreathe! I’ve seen them twice – once in a small club venue and once opening for Taylor Swift (can I admit I was pumped to see both acts of that show?) Awesome performers and so much intensity on that stage. The first time I saw them they opened with Prisoner (which at the time I hadn’t heard) and they pretty much blew the roof off the place. I think Owl City, Switchfoot and Angels & Airwaves are three bands that I’ve found myself relating a lot to over the last few years especially. They have a special ability to balance disappointment and optimism, loneliness and hope, thoughtfulness and fun. @Jason, YES! Angels & Airwaves. I saw them in concert here in Portland. Took me back to my glory days of Box Car Racer and Blink 182. I’ve only heard one song from Owl City but I will check them out. @Baylee Brown, Thanks! They are pretty fun to see. Hopefully you can go to a small show at some point. 1. Thank you for your support. I will say, I’ve mellowed over the years. If I dont have Sarah to lift above my head…there’s less momentum. 2. Pshhh. I told you he was married! (Or at least I thought he was.) I don’t know if I could be with someone who stared in Karate Kid 2. 3. I’m getting my hair done today. 1. I’m laughing quite hard about the “scolding” I received yesterday for admitting to operating the clutch with my right foot. For goodness sakes! You bike with headphones on?!? My life soundtrack would be a whole lot of jazz, but the past few years would be mainly Dave Barnes. I love listening to his music – all of it! By the way, I hate the nickname “baby,” too, and refuse to use it or answer to it! I saw them at Rock the Light last year! They were fantastic!! My soundtrack would probably be New Radicals album. Except without all the drug references. Or perhaps Taxiride. Most of their stuff resonated at some point in my life. The band I’m most loyal to is Human Nature. Since I was 16, I have loved them. Even saw them on my honeymoon! But since they seem to have traded their original music for Motown covers, they probably can’t be the soundtrack of my life. I do however have a list of songs for them to cover when they actually do the soundtrack for the movie of my life. I was totally into pop when I was was pre/early teen years. You definitely would have found me singing along with Tiffany and Mariah Carey, and I’m sure my mom would tell you I sounded great. Still every time I hear I Think We’re Alone Now and Hero, I’m definitely back to those days.